Colorado Right to Rest Act voted down — We continue the fight until all have the right to rest…! 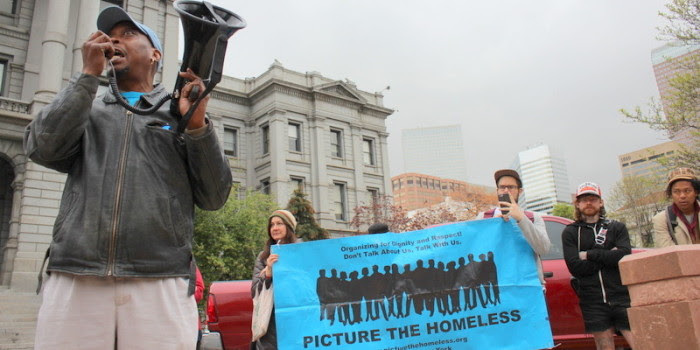 Rally Before April 27th R2R Hearing — representatives from 17 states and 38 organizations fighting criminalization of homelessness in their states rallied in support of the Colorado R2R! Because this bill did not pass the people of Colorado will continue to be awakened in sleep and moved about the city with no place to legally rest; the people of Colorado will continue to be ticketed and later thrown in jail for covering up with a blanket to stay warm; the people of Colorado will continue to hear taps on their window from officers telling them they can’t sleep in their own car. And the list goes on of all the dehumanizing, destructive, costly, and ineffective forces that will continue to be used to criminalize existing in public space. ← Colorado Right to Rest Act Hearing part two April 27!